A while ago I made buffalo cauliflower wings and I’ve tried cauliflower fried rice. When I had half a head leftover from the cauliflower tabbouleh, I wanted to try something different with it. Side note: OMG, the amount of cauliflower that you get from one single head is endless! LOL. This time, I went with a barbecue theme since I had corn, barbecue sauce and other ingredients in the fridge. Preheat oven to 400 degrees and line a cookie sheet with foil. Cut the cauliflower into bite sized florets. I chop the whole thing, stems and bushy parts because I don’t mind. If your family only likes the bushy parts, then that’s perfectly fine and you can save the stems for something else. Toss the cauliflower pieces with the soy sauce, liquid smoke, spices, and lemon juice. Spread the bits out evenly on the cookie sheet and roast at 400 degrees for about 20 minutes. Remove from the oven and toss with the barbecue sauce until coated. Spread them back out on the sheet and bake for another 10 minutes until the barbecue sauce has mostly dried. Remove from the oven and cool slightly. Makes 4 servings at approximately 48 calories each – 2g protein, 10g carbs, and 0g fat. I made a bunch of tofu nuggets with leftover seasoning mix to make a BBQ salad. I drained and pressed the tofu, cut them into nugget pieces, and tossed them in the shake and bake coating. They came out perfectly. You can also do the same with pork or chicken pieces. 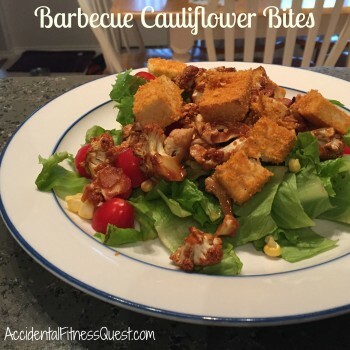 I tossed together lettuce, fresh corn, and tomatoes for the salad and topped it with the barbecue bites and nuggets. Add a drizzle of ranch or even bleu cheese dressing and you’ve got a great meal full of veggies. The bites go great on a veggie dray for dipping. You can also throw them in a salad like I did, or use them in a wrap.